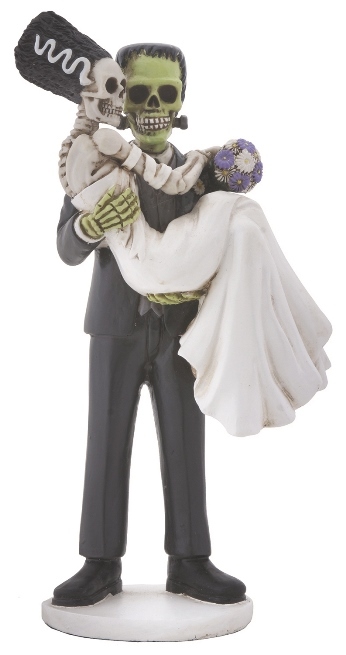 Frankenskull and Bride Figurine [8581S] - $29.69 : Mystic Crypt, the most unique, hard to find items at ghoulishly great prices! Frankenskull and the love of his life have finally decided to tie the knot! This statue shows Frankenskull carrying his bride! He is wearing a grey suit with black shoes. She is wearing a beautiful white dress with wrapping around her arms! This is great gift for any monster fanatic! Meticulously Crafted and Masterfully hand-painted, sculpted, and cast in high quality resin. Great for any Goth collector, children, or the young at heart. These figurines are adorable, and make great gifts as well. Approximate Measurements: Height: 8" x Width: 4" x Depth: 3"